Original painting in acrylic on cotton, framed in traditional style with Nepalese silk brocade material ("Paymachandi" - small flower design) with decorative metal weights, painted in acrylic on cotton, painting size 55x 38cm. The painting is decorated with 24ct gold. SOLD (in charity auction). 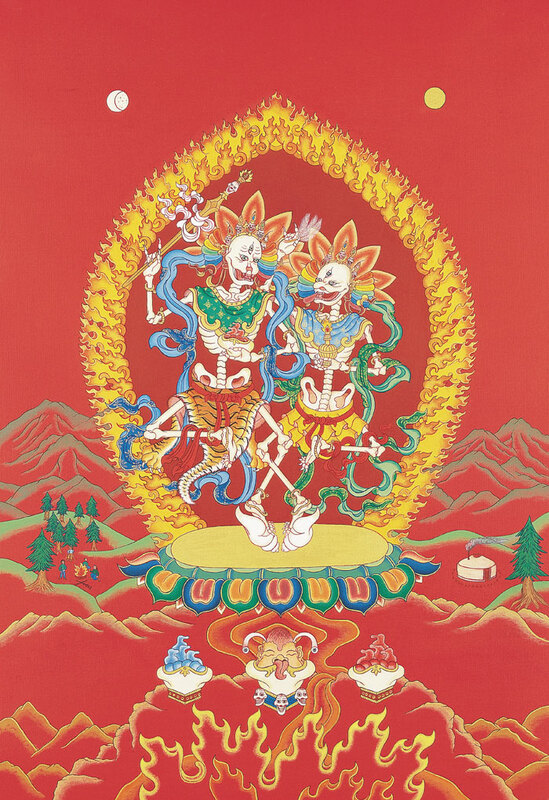 The dancing skeleton couple, "Keepers of the Graveyards", are dharma protectors for practitioners of the Heruka and Vajrayogini practices. They represent the joy that is found in the wisdom of the ancestors and the development of inner strength through connection with the ancestral realm.